Like in a not very elaborate shell game, the US President Donald Trump claimed on Wednesday that NATO members should raise their defense spending to 4% of GDP, two points above the 2% the Atlantic Alliance agreed to reach by 2024. 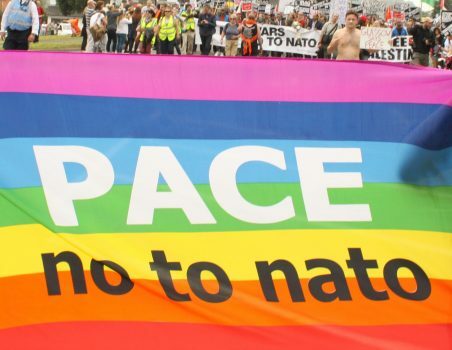 Trump made this statement yesterday at the NATO Summit in Brussels, while several Belgian and European organisations demonstrated against NATO and asked for a reduction on military expenditure. The mere suggestion of doubling the 2% spending target – which by the way has never been proved as a real need – furthermore hides the attempt to increase the profits of the arms and defense industry, on behalf of which Trump and other leaders of NATO countries are negotiating. We regard it as unnecessary to increase a global military expenditure that has reached $1739 billion in 2017, growing again, along with the manufacturing and trade of arms and global instability. Under the pretext of the Russian threat and the fight against international terrorism, NATO countries will contribute to the next initiatives of the Atlantic Alliance. According to the Secretary General Jens Stoltenberg, they will contribute with new mechanized battalions, military drones, combat vessels, and with an updated command structure, with new personnel and hybrid teams focused on cyberdefense and security. Meanwhile, poverty is on the rise in developing countries and extreme poverty has returned to the USA, while their president blackmails the other countries with abandoning the Atlantic Alliance if governments don’t fulfill their commitment to increase the money invested in arms and war to the 2% of GDP, despite the fact that this is not an obligation, but an agreement. We consider this as a clear and intolerable attempt to interfere in other countries’ domestic politics. The money pumped into the military and the arms industry would be far better spent on eliminating hunger and poverty, providing education, quality health and culture to everybody, reversing climate change and improving social justice and gender equality. Only 10% of the global military spending would be enough to achieve some of the UN Sustainable Development Goals and to cover real human needs. This claim is now more valid than ever, as there is an urgent need to remove for once and for all the prevalence of military mindset and the way it is implicit in aggressive alliances, notably NATO. Instead, we need to strengthen the process towards real democracy and focus upon diplomacy, international law and intercultural cooperation, in order to achieve environmental and human security, where the real threats we face globally lie in.